Has your child outgrown their high chair? Do they want to sit at the table on a proper chair, like you? Our practical booster seat helps your child up to the table without needing to sit on your lap or slide around on cushions. Your child sits safely and securely on the booster seat, and can focus on mealtimes and what’s happening around the table. Suitable for children aged 3 years and upwards. Comfortable height: Your child can reach the table without needing to sit on your lap. The booster seat has an anti-slip textured surface that keeps your child sitting safely. Compact and portable: The booster seat is so light that even a child can carry it. It’s convenient to use at home and on the go. 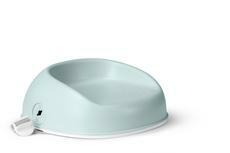 Easy to keep clean: The sleek surfaces of the booster seat are easy to wipe clean with a cloth. It has no cushion that requires washing. Child-safe design: The booster seat rests firmly on the chair and is held in place by a sturdy strap. The strap has a childproof buckle for added safety. Rubber strip for good grip: The rubber strip underneath the booster seat gives it a good grip against the chair. Fits most chairs: The booster seat can be used on most kitchen and dining chairs, and will not leave any marks on the chair or seat pad. At BabyBjorn, we always put your child’s safety first! When you buy a booster seat from BabyBjorn, you can be sure that the materials continuously undergo rigorous testing for Bisphenol A (BPA) and other harmful substances, and that they are certified food safe. Age: From 3 years and upwards. Material: The booster seat is made of BPA-free plastic. Product care: Wipe the booster seat with a clean, damp cloth. Tested and safe: The booster seat complies with the ASTM 2640-17 safety standard. It’s great. Very light weight plastic and hollow so will be great for travelling, you could pack it in your case and pack clothes inside it. My almost three year old can get up and down from the table herself and it’s very stable.